The public at large relies on elevators almost daily to gain fast, convenient, and safe access to another floor in multi-level structures. From schools to offices, everyone seems to hold some fascination about their local elevators. If you are in the market for upgrades or upgrades, it pays to find a company that delivers the right elevator parts at the right price. Kohtler Elevators is here to serve as your professional resource for elevator cabs, doors, and entrances. We are passionate about quality, and will work hard to ensure your business benefits from the best results. Today, we’ll highlight a few elevator FAQs to help you understand how safe and effective modern elevators can be. When you’re ready, be sure to browse our elevator parts, and email us to receive a quote on your next upgrade! Do the “Close Door” buttons actually work? Much like the ‘walk’ button at crosswalks, the arrow that closes your elevator door is actually there for comfort. Why? 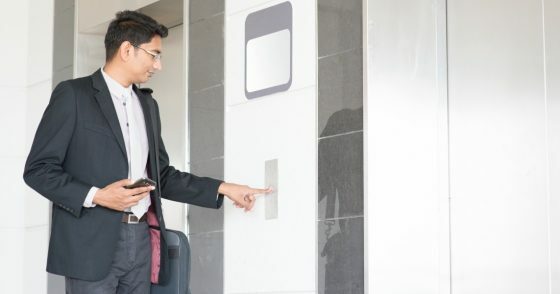 The button that closes doors on command was made inoperable in the 1990s, as the Americans with Disabilities Act (ADA) enforced enough time to allow someone with disabilities to board the elevator. When you are mashing that close button, keep in mind that unless you have an emergency access key, the doors will not close any quicker! How much room do elevators need? While elevator cabs do vary in size, commercial minimums dictate that the cab should be at least 68 inches wide and 51 inches deep. Elevator doors that open from the middle require additional space. The average size of a commercial elevator is around 22 square feet, but remember that different buildings can yield different systems. While not perfect, elevators today are known to be among the safest mechanisms in the world. Multiple safety devices are in place to prevent any risk of a freefall. A recent article stated that elevators are twenty times safer than escalators, with vehicles being even more unsafe. Nearly 50,000 people died in cars last year, an alarming figure compared to the annual average for elevators, which is just 27. With a fatality rate reaching out to the ninth decimal place (try dividing 27 deaths by 18 billion annual trips), the reality is that modern elevators are much safer than most people realize. Does the certification from Underwriters Laboratories matter? Yes! UL serves to inspect elevator parts across the country to ensure all products conform to stringent standards. Standardization for elevator cabs, doors, and more can help to minimize errors and improper fits when installing new components onto your existing system. UL partners with renowned engineers to ensure that their label of approval means a lot when it comes to precision and quality. How are your elevator parts better than the competition’s? Kohtler Elevators was founded to enhance the elevator industry, relying on our technical expertise and innovative approach to provide the most stunning and advanced products on the market. It can prove challenging trying to find the right accessories for your commercial elevator, which is why our team backs all of our elevator parts with complete customer support. Ready to get started? Contact us online to learn more, and be sure to email us for your free quote on all of our top-quality!